If you could change the present—or the past? Would you do it? There’s more at stake in The Time Roads by Beth Bernobich than just simply fixing the present—or preventing a dark future. Often, the roads of time tell intimate and personal tales of tragic defeats and sacrifices, or small and private victories that prevent a dark future from coming to pass. The Time Roads tells the story of the fictional land of Éire who wishes to solidify its presence in the world through technological (and political) advances. Enter a bevy of characters interested in studying the passage (and manipulation) of time in order to meet both their own and their country’s demands. For me, this story started very strong. We’re introduced to a young woman on the cusp of becoming a queen, both trying to navigate the complicated words of politics and personal relationships. I loved reading about Áine. She was a strong woman who is forced to make some tough decisions—and sacrifice personal relationships in the name of her country. Later in the story, we’re introduced to several other point of views, some of which will have you second guessing the characters (and yourself), trying to determine what has happened and what remains only in the minds of the characters as a past that never came to be. I think the strength of this novel lies in the expert descriptions of the world and the intrigue. It’s very easy to get caught up in the overall story and be able to visualize yourself in this complex and detailed world. Even with the Victorian elements mixed with steampunk, it never felt forced or unbelievable—really, it felt like this is the past that should have happened, or very well could have. Blended with the political intrigue and danger and it made for an often tense and thrilling read. I see a tremendous amount of potential in Bernobich’s writing. She has a fantastic eye for detail and a remarkable gift for making her world feel fully realized. That being said, I think the storytelling would have been stronger had it focused on less characters. Sometimes, as they say, more is less and here I think that perfectly sums up most of the issues that I had with the story. As the perspectives jumped several times, it was a little confusing to follow (especially with blended timelines, or timelines disappearing) and something that I think would have worked a bit better in a longer novel. As the novel progressed, it was harder for me to maintain a connection with characters that I either didn’t know much about, or only knew about vaguely through other characters. It definitely would have heightened the overall story had it been focused on one or two point of views, but I can see why the author used multiple viewpoints as I believe the main focus was really the time travel, and how that affects the individual people of this world—and not so much the characterization. Overall, I think there’s a great balance of romance, mystery, adventure, and political scheming, so I believe this would definitely appeal to anyone who is looking for smart, Victorian-style, steampunk. I will be excited to see what Bernobich comes up with next because I think it will only get better from this point. CLICK HERE TO GET YOUR COPY OF THE TIME ROADS TODAY! 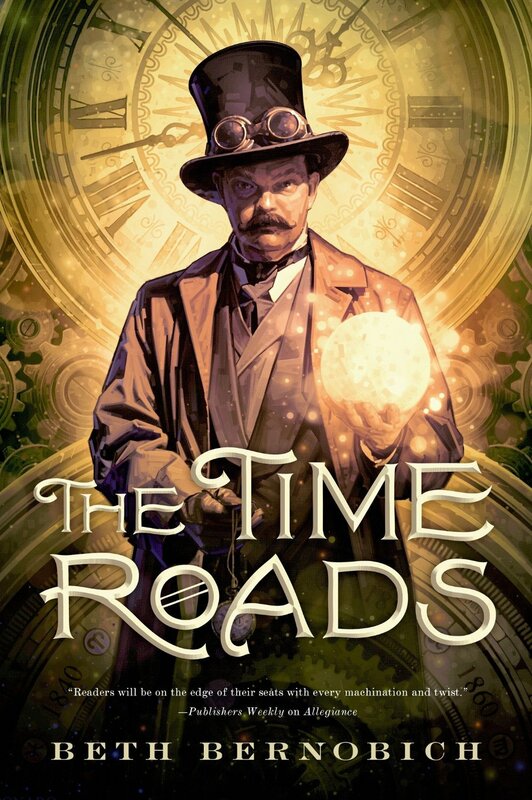 A review copy of The Time Roads was provided by Tor Books via NetGalley.